The town of Ostend, where Ensor was born, changed, from a small fishing town to became a tourist destination in Belgium. That’s why, lots of times, he uses the symbol of the mask. 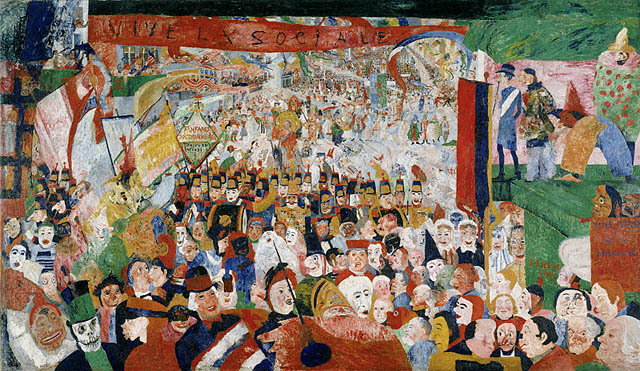 In this painting, we see some kind of a carnival mixed with a political demonstration and, Christ, in the middle, entering Brussels. In 1879, the liberal government of Belgium had banned the religious education thorought the country to weaken the power of the church and, in 1886, the king of Belgium had declared the need of better conditions for the working class . In the painting, we see Christ entering, but not getting much attention of the people in the demonstration. Maybe, Ensor wants to show us the different positions regarding the decision of the liberal government. On one hand, we hace the ones who see the need of a Godless nation (“Long live to the social revolution” is read on the sign centered above); on the other, the one who see the need of the religious education in schools (as we see in the sign on the below far right, which says “Long live Jesus Christ, king of Brussels”). ~ by Álvaro Mazzino on June 26, 2010. For photos and videos, the Note 5 wears a 5MP chat cam on its face and there’s a 16MP workhorse of a camera at its rear. It captures 2K video 30 frames per second and 1080 content at 60 fps. Under the impression that he was unboxing the “Silver Bullet” Nike Air Max 97 he ordered, this lucky (or unlucky?) shopper’s package actually contained the aforementioned Jordan retro. From the packaging to general appearance, these shoes don’t share many similarities, so it’s a glaring mishap by the shipping center. This entry was posted on June 26, 2010 at 10:56 and is filed under Expresionism, Surrealism.You can follow any responses to this entry through the RSS 2.0 feed.You can leave a response, or trackback from your own site.